Orange Amplifiers are frequently referred to as Britain’s first boutique amp manufacture. The company’s respective trade name Orange is known as a classic blend of Brit-type midrange punch and tight detailed top end. For a brief time in the Seventies, Orange amplifiers were among the most popular, however, the company didn’t keep up with consumer’s demand… until recently. Over the past few years, thanks to all the experience of Orange’s designers, the company has recovered a lot of ground and is once again becoming a hot-product for superstars artists from Prince to Slipknot. Orange’s most recent achievement is the limited-edition OR50, a 40th anniversary tribute to both the company and adored 1972 “Pics Only” amp model, nick-named for its use of display images on the Plexiglas front panel in place of text. The OR50 is more like a modern revelation than a reissue, and it easily achieves everything from dimensionally morose high-gain tones. Orange Amplifier’s immaculate build quality is only a fraction of their legacy, and the OR50 model is no exception. 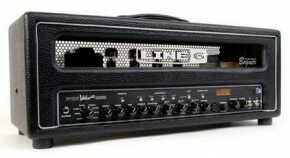 Everything on this amp is sturdy built with impeccable standards, from the custom eight-leaf power transformers to the basic components and 2mm rugged chassis. Suffice to say, it’s easy to see Orange’s determination in their high-end construction that certainly inspired Orange’s massive rack handles and oversized control dials. Let‘s take a peek inside the OR50. Here we’ll find two EL-34 power tubes that spawn the amp’s 50-watts, look in a little deeper and we’ll see the three 12AX7’s that produces the front-end gain. On the back-side, we’ll see three speaker outputs: two of which are eight-ohm and one that is a single 16-ohm output. Even though the OR50 is a single-channel affair, the amp’s array of gain and EQ settings will undoubtedly give a number of multi-channel amps a run for their money. Similar to the “Pics Only” amp, the OR50 features pictographs on the amps Plexiglas front panel to indicate each control function. The OR50 controls include treble, middle, bass, gain, high frequency drive, and master volume. 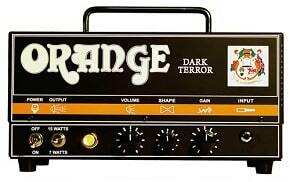 Orange described the HF Drive knob as the “secret weapon” because it simultaneously blends and increases the power amp gain and presence. Which means this control can adjust the attack and intensity though one control knob that can achieve tones that range from soothing cleans to raging drive. What’s more, the master volume allows high gain tones at low volumes and, on the other side of the spectrum, the amp allows sparkling clean tones at extreme volumes. Now that’s flexibility. Orange’s OR50 is like a boutique amp prodigy, because of the harmonic response that it produces and due to the fact that it doesn’t always acts as excepted. The amp’s distinctive power and preamp section emit overtones like sporadic rain drops on a tin roof, no two hit the same way. The OR50 confidently responds to each not and, like mentioned earlier, can be adjusted to complement any guitarists array of sounds. Although the amp is EL34-driven, it reveals a Stratocaster’s spherical chime, crisp lows, glassy sparkle and presence. Similarly, my Agile AL-3100 (Les Paul copy) mahogany’s thick warmth delivered the Orange with a was opaque and rich sparkling tone rather than soft and murky. With the gain control pushed near ten o’clock the tone evolved to a more cultivated response which is perfect for classic rock and blues riffs. Increasing the volume at this gain level made the amp delivered inspiring tones that would make even Angus Young blush. Bumping the gain level over the 12 o’clock position commanded a mean saturated tone. The OR50’s thick distortion is definitely aggressive enough to play hard rock and metal–Orange’s naturally note separation remains fully integral at these hard-hitting settings. 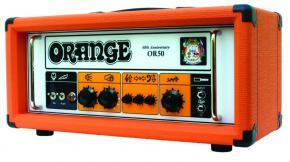 Orange’s OR50 commences superb dimensions that is rarely heard in the company’s high gain stature. Yet more gain, attack, harmonics and power amp distortion can be shaped through careful manipulation of the high frequency drive unit.